When the Germans occupied Poland in 1939, Harry Blas, along with all other Jews in his hometown of Łódź, were ordered to leave their homes and move to the ghetto. His father's distribution business was confiscated and his family was moved to a small apartment with few belongings. Harry was forced to work in a vegetable market; his brother volunteered to work in a labor camp in Germany. Their sisters Malka and Freida were both married and had children under the age of five; Malka had two little boys and Freida had one. To feed his family, Harry stole vegetables from work. Conditions were miserable in the Łódź ghetto—thousands of people died from hunger, disease, and the cold. Harry's grandparents, Israel and Liba Blass, died in the ghetto. His father, Peretz, nearly lost his mind under the harsh conditions, and his mother Sara's health deteriorated. People were continually sent out of the ghetto to work as slave laborers in ammunition factories. In August 1944, the remaining Jews in Łódź were ordered to report to the train station where they were loaded into cattle cars and taken to Auschwitz. When they arrived, they were commanded to form lines according to their age and gender—one line for old men, one for old women, one for women and children, and another for young men and teenagers. This is the last time that Harry saw his family, including his young nephews. In the barracks, the prisoners had no blankets or pillows. They slept in their clothes, and their bathroom facilities were crude outhouses. Their "shift beds" were bunks filled with straw. In the morning, they awoke at 5:00, lined up for a headcount, and then were permitted to use the outhouses and wash their faces and hands. They returned to the barracks for the same breakfast every morning, a bowl of "soup" (hot water with a few potatoes) and a single slice of bread. After breakfast, they were sent out to work all day, and returned in the evening for the same meal. Hunger made it difficult to sleep. Even worse, at night a terrible odor pervaded the barracks. Though he did not realize it until later, the smell was the flesh of prisoners being burned. One morning, Harry had some trouble tying his shoelaces, and though he rushed to join the lineup, he was one minute late. He ran out the door, where a German soldier clobbered him on his head with a rifle. Harry fell to his knees, and the soldier continued hitting him, this time on the legs. He was rendered unable to stand, but his fellow prisoners helped him back to the barracks. He was bleeding from both his head and legs; one prisoner cleaned his wounds and used the sleeves of his undershirt to bandage his legs, saving his life. The prisoner could not bandage his head because the visible wound would have prompted the Germans to send Harry to the gas chamber—sick or wounded prisoners were immediately put to death. After six weeks in Auschwitz, Harry was sent along with some other prisoners to the train station and again they were packed into cattle cars. They journeyed without food or water to the next destination, which German soldiers told them was an underground ammunition factory in Austria. When they arrived, they were given something to eat and drink and a blanket. The next day they learned to work with machines and tools. They rode a bus to work, and always received the same soup and bread for meals. One day a German soldier was eating an apple in front of Harry. "He slowly peeled the apple," Harry later recalled, "which to me looked like the most delicious food I can remember seeing. He must have sensed that I was watching him and longing for the apple peel. Surprisingly, he decided to give me the apple peel. I was so grateful and thanked him. But as luck would have it, this kind-hearted German (forgive the paradox) was transferred." Harry was haunted by the memory of his family and suffered from frequent nightmares. He wondered if his brother was still alive at the German work camp. Much later at a Gypsy camp, he learned what happened to the people he never saw again at Auschwitz. "As I understand it, once people arrived they were instructed to stand in line so they could take showers. These people were stripped naked and shoved like cattle into these rooms…these showers. Once inside, the doors were sealed. Instead of water, gas ran out of the showerheads killing all inside within minutes. Moments later, the doors opened and fellow prisoners were required to carry the dead out.... Knowing all of this, I had no desire to go on living." The prisoners who had the unfortunate job of cleaning up the bodies kept the secret because their fates depended on it—they would most certainly be put to the same death if they were suspected of sharing the horrific information with their fellow prisoners. Harry became extremely ill in April, in such pain that he was unable to eat even the "potato water." Unlike Auschwitz, at the work camp he was actually sent to the infirmary where he was given food, water, and medication. His condition improved, and later that month he was well enough to notice a commotion outside. The American army had surrounded the city, the Germans were running away, and the war was finally over. The Americans arrived, freed the enslaved workers, and although most in the infirmary were too ill to leave their beds, they cried together for the last time as prisoners. American soldiers provided the prisoners with food and water and had doctors examine them. Survivors came, looking for family members. "You could see the hope in their eyes as they entered the hospital. Suddenly, out of nowhere, I heard what I thought was my brother's voice. Little did I know, he had been in the same camp the entire time. When we saw each other, we embraced and wept for what seemed to be forever." Harry’s brother had brought him clothes and shoes, and they both received money after the doctors released them. Harry and his brother returned to Łódź to search for family members. The city's search department and the information centers that were established to assist in finding family members had no information about Blass survivors (Harry later changed his name from Herszl Blass to Harry Blas). They were able, however, to find some friends from their old neighborhood. "We all decided to live together and begin a new, extended family while we continued our search." With financial help from many different sources, they traveled to Austria, Italy, Czechoslovakia, and the Soviet-controlled eastern area of Germany, and while some of Harry's friends were lucky enough to find loved ones through the search stations, he was not. 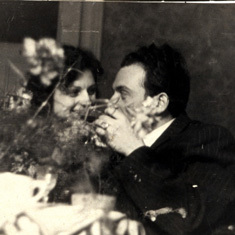 Harry's brother married a girl from Łódź, and while searching in Germany, Harry met Erika Stockfleth. Erika was born in Grevesmuhlen, Germany, to Marie-Gertrude Botta-Stockfleth and William Stockfleth. 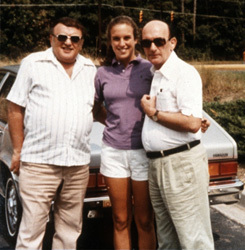 Her mother, who was Jewish, had been raised by a great-aunt after her parents died in a train wreck. In 1941, her father, a Protestant, helped a Jewish family escape Nazi Germany by taking the family to Hamburg and helping them buy tickets for travel to Uruguay. Upon his return to Grevesmuhlen, he was arrested by the Gestapo and sent to fight on the Russian front. His family never saw him again after his arrest, and believed that he may have perished in a Russian labor camp. Afraid that their Jewish identity would be discovered, Marie-Gertrude hid Erika and her younger sister, Heidi, with a gentile girlfriend. Marie-Gertrude told Erika that she was Jewish shortly before going into hiding, but she did not tell Heidi, instead saying that she was sick as an excuse for the girls being sent away. Shortly before the war ended, a farmer took the sisters home and they arrived a few days ahead of American troops. Erika’s mother died of pneumonia in February 1946. Her daughters could not find a rabbi in Grevesmuhlen and the Jewish cemetery had been demolished, so their mother was eulogized by a Protestant minister and buried in a Christian graveyard. Erika met Harry while he was hospitalized in Germany. She had come to the hospital to visit a school friend, and Harry was in the next bed. 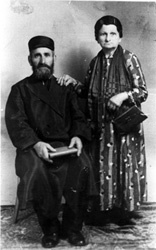 After Harry was released, he introduced Erika to his brother and sister-in-law, who were living in Grevesmuhlen with other Jewish displaced persons from Łódź. 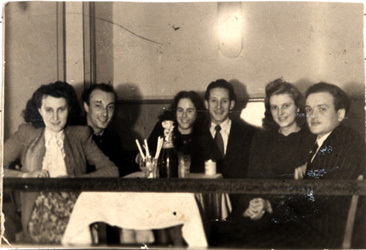 In 1948, this group, including Harry and Erika, decided to cross the border into the western section of Germany controlled by the British and Americans; Erika’s sister had already crossed the border and joined her in Hamburg. Before crossing, Harry proposed to Erika, and she accepted, though she recognized that she was not in love. She believed that love would come with time, and it did. The Jewish community in Hamburg arranged for the group to obtain apartments, food, and clothes. As Harry re-established his life, he did not give up hope of finding family members; he continued to search, posting his name in numerous search stations. Harry and Erika married on January 20, 1951, and they made the decision to immigrate to the United States. According to Harry, "In February 1952, our dream finally came true. When we arrived in New York, the HIAS and their good people helped us. They were waiting for us when we arrived. My wife and I had our own furnished apartment. Our refrigerator was full of food, a sight I had almost forgotten." They lived in a Jewish neighborhood. Harry worked in a gas station and Erika worked in a factory making children's clothing. According to Harry, "It was a terribly hard time for us.... Our greatest problem was overcoming the language barrier." In 1966, Harry found that his first cousin and her family had settled in Charleston, South Carolina. With their five-year-old daughter, he and Erika moved from New York to Charleston. "Today we count our blessings. Our daughter married a good man and they have a wonderful daughter."